Located east of Logan Square, the Cathedral Basilica of Ss. 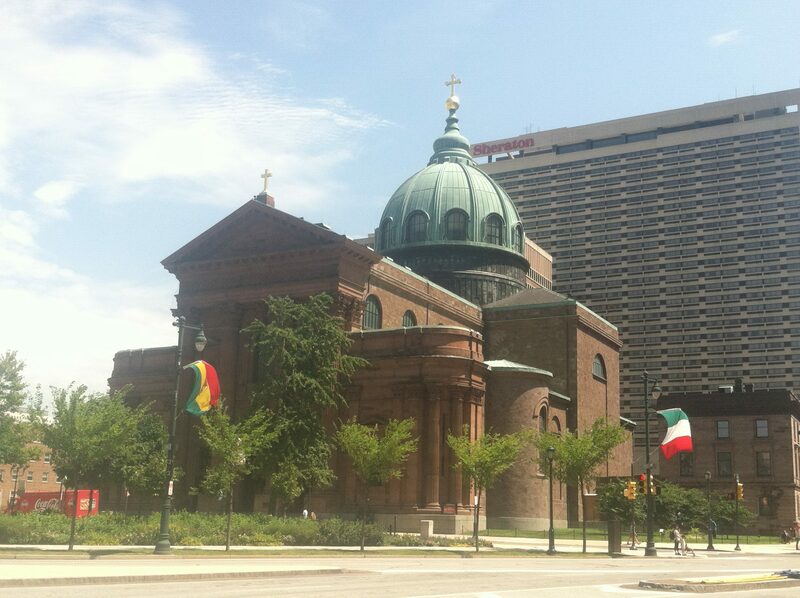 Peter and Paul is the seat of the Archdiocese of Philadelphia, one of America’s largest. Two popes and three saints have visited, including Pope Francis in 2015. It was completed in 1864, after nearly 20 years of construction. The anti-Catholic Nativist Riots of 1844 were detrimental to Philadelphia’s Catholics, which even led to the burning of two churches. Those riots are also the reason for the Basilica’s lack of stained glass, as they could not be broken by rocks. Legend has it that there are walkways on the roof for armed men to defend the Cathedral. It is a majestic cathedral, despite the unassuming exterior. The brownstone facades are unadorned on the north, south, and east sides, although there is an intricately sculpted facade on the west front. The western facade has statues of Peter and Paul near street level, with the keys and sword, respectively. Higher up, statues of Mary and Joseph are placed on either side of the central window, one of the Cathedral’s few. The Cathedral is topped by a recognizable copper dome, with a shining golden cross on top. On the inside, the Basilica is extremely massive, complete with an incredible apse where the main altar stands under the golden baldachin. The dome has a painting of God in the center, with other holy figures surrounding him. There is some stained glass under these paintings, which were done by Constantino Brumidi, who also painted the Rotunda of the United States Capitol. Brumidi also painted the murals in the transepts, one of the Nativity, and one of the Ascension. The organ is also magnificent, with over 4,000 pipes. 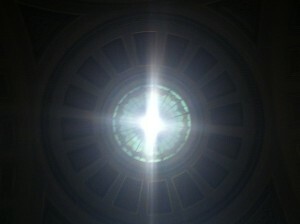 The aforementioned window at the back of the Basilica depicts the crucifixion, and allows light to enter the Cathedral. There are elaborate shrines instead of stained glass windows, each one dedicated to a particular saint, including Philadelphia’s own St. John Neumann and St. Katherine Drexel. For a visitor, the shrines are some of the highlights, which serve in the place of stained glass. The shrines on the left side of the Cathedral are devoted to St. Katherine Drexel, St. Patrick, the Lady of Guadalupe, and St. Joseph. On the opposite side, the shrines are dedicated to St. John Neumann, Holy Souls, and the Blessed Virgin Mary. This side has the baptismal font, which has one of the few stained glass windows in the Basilica. North of the Basilica is the Chapel of the Blessed Sacrament, which was added to the structure in 1954, when the apse was expanded. It has a set of stained glass windows, although they are quite modern. There is a circular window depicting the Virgin Mary in the back, and the chapel even has its own organ. It even has some sculptures and a crucifix up by the front. It’s even quieter than the Basilica itself, and may even be completely empty. Outside, there is a statue of John Neumann by 18th Street. Admission is free, although you can donate if you wish. Daily mass is at 9 and 12 on weekdays, and a 5:15 vigil on Saturday. On Sunday, there’s mass at 8, 9, 11, and 6:30, as well as a 12:00 Spanish mass. Tours of the Cathedral are available, which further explain the many shrines and architectural details.